1st grade. This is my house! we are working with the "HOUSE" subject and vocabulary ... always linked to our creative side. We've already said how excited this group was about writing some kind of cluedo's game. We must say that the final two games that they wrote were great! As everybody knows... Zomlings RULES!! So 4th grade prepared a big project around this great topic! The second part was to define and to write down the rules for the competition! After some clay, some paint and lots of imagination the result paid the effort! We had a great time recording the speeches... so here you will find the final video where our artists presents their creations! Enjoy it and give us your feedback! P5 is working on "The winter", we talk about the clothes, the colours, the weather.... and you know what? Yesterday during the class we could see through our windows how the snow started falling on the playground. We have been focusing on this topic at 3rd grades groups. It is an issue which implies learning words and expressions used on everyday life, which are at hand all around us, at school, at class, at streets, and so on. The first thing we have seen is about natural resources of the Earth, Doing so, the importance of recycling has been introduced by means of funny activities like a game and conversation at class. Then, we have started to build some dustbins like those they use at real life. We are doing that at this time. Still working on it! I wish we can post some photos as soon as possible! One other nice thing is that another 2nd student has incorporated lately to our club, welcome Jan! P4 This group has a lot of fantasy !!!!! Hello everybody !!! We made a fresh start in 2017. P4 was still into the magic feeling of the kings. Are you happy , happy , happy with your toys. With your bear...and with your doll. With your bike and with your ball. And again and again we played the theatre game of the kings.. The king; What do you want ? The kings go to the houses and bring a present for each child. 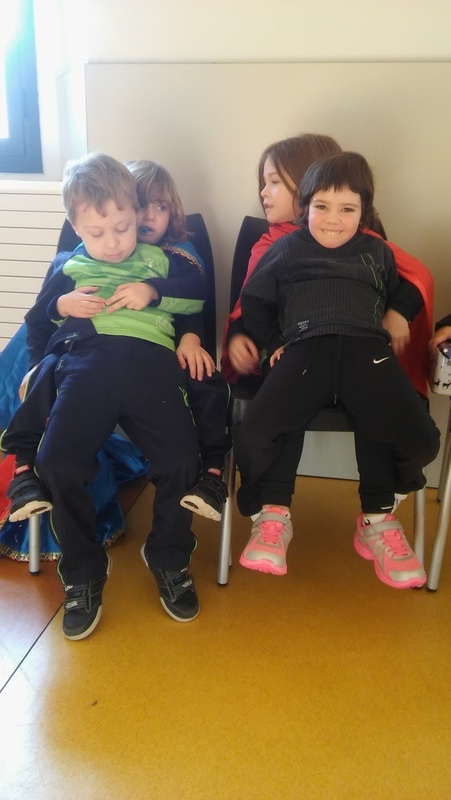 In this picture ...Tura and Eulalia are the kings and Julia and Jordi the children. 6th grade. A murder in the school. Last week we were solving a murder as if we were detectives. It was a game in which, everyone had a role with information to share. They interviewed themselves to get all clues about the characters, alibi, relationship with the victim. They enjoyed so much the game, that now they are the ones to create in teams two different situations, with all descriptions of roles and context. Once everything is writen and ready, we'll play both "creations" and find out "who is the murderer". 5th grade. Kiss the sky. these last days we have been working with some pop songs that we usually listen to without knowing the meaning. We went through listening exercices like filling up the gaps, choosing the right word...even short karaoke. On one side, we realised that we love and sing some songs, and then we know deep in the meaning of the lyrics ... then, they don't seem so adorable. So we finally voted and chose one song to learn the lyrics, sing it together and even ellaborate an invented "videoclip". The song is called "Kiss the sky" and we are going to focus in the first 3 paragraphs. So far, we have been singing, spliting the sentences for each one to sing, and we are already thinking on the sets and coreographies. Let's see how this developes!! Before the end of the year, the P4 class read the book "Go Away Big Green Monster!" They enjoyed it so we decided to represent the green monster with play-do... we LOVE play-do!! as soon as we came back from Christmas days, we shared some nice experiences of the time we spent with the family. So we came along relatives vocabulary: mother, father, brother, sister ... and why not, some pets (dog, cat, turtle...). After that, we drew a portrait of our own families and shared it with the classmates.